On August 9, 2014, a young unarmed black man named Michael Brown was shot six times by a white police officer, Darren Wilson. This incident occurred in Ferguson, Missouri, a small suburb of St. Louis, and sparked national interest, social media campaigns, and a new group of young activists who jumped up to protect the rights of minorities everywhere. Many members of the Ferguson community held protests and vigils in remembrance and solidarity with Michael Brown. Although the majority of these protests were peaceful, the way the police handled the situation attracted widespread attention in the media from well outside the small Missouri town. What happened in Ferguson also sparked a national conversation about police brutality, and the greater issue of racial prejudice that minorities face daily. Unfortunately, the majority of white Americans believe racism is no longer an issue; but what happened in Ferguson, combined with other similar incidents of unarmed black men being shot by police (including the death of a twelve year old in Cleveland, who only had a toy gun) shows that racism is still alive in this country. Despite the fact that it was Officer Darren Wilson’s gun that took Michael Brown’s life, Wilson was placed on a paid leave of absence while a grand jury deliberated on whether to indict him for the murder of Michael Brown. On Monday November 24, 2014, the grand jury decided not to indict. Essentially, Darren Wilson walked free and will continue to live his life while Michael Brown’s life was cut short at the young age of eighteen, without justice. The failure of the grand jury to bring an indictment sparked nationwide protests, vigils, and “die-ins” to show solidarity with those who have been murdered by police. 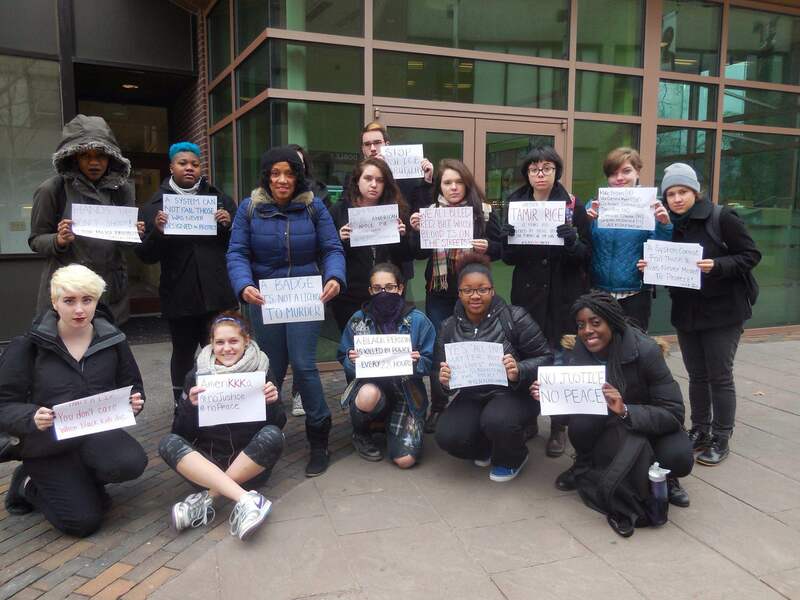 Students on the Lesley University campus showed their awareness and support, as well. Sponsored by Students for Social Justice, Lesley students participated in a Die In on Tuesday, December 2, 2014 on the Doble Campus quad. For thirty minutes, students lay on the ground with their hands up to symbolize the “hands up, don’t shoot” image that has become common among protestors. The protest started with a speech from Col Williams, the organizer of the event. 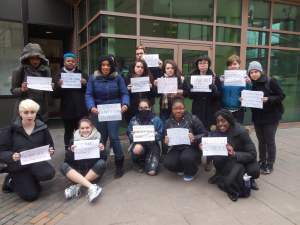 During the thirty-minute die in, other students, faculty and staff of Lesley University walked by, some stopping to look at the signs held by protestors and others just passing through and sidestepping the bodies on the ground. After the die in, Williams reminded students that Mike Brown’s body was left in the streets for four and a half hours while people passed by and neglected to help. In order to raise awareness to the general about the injustices many minorities face daily, it is important to protest and show people that the world isn’t perfect and there are a lot of horrible tragedies happening daily. Despite this, there are ways to make things change, and that’s by using our voice, whether it’s through political participation, protesting, or even expressing our support through social media. This situation of police brutality is not an isolated event, and it does not always involve guns. On July 17, 2014, Eric Garner, an unarmed black man from Staten Island, New York, was choked to death by a police officer. Garner was about to be arrested for allegedly selling untaxed cigarettes on the street, and the officer attempted to subdue him by placing him in a choke-hold. Despite telling the officer “I can’t breathe” multiple times, the officer did not stop, and proceeded to hold him down on the ground, ignoring his cries and his struggle for breath. This entire situation was caught on videotape, and yet, here too, the officer was not indicted. Racism in America is alive and well. Black individuals are being killed almost daily for absolutely no reason aside from the color of their skin. Some studies show that a Black person is killed every 28 hours. That is not a statistic anyone should be okay with.